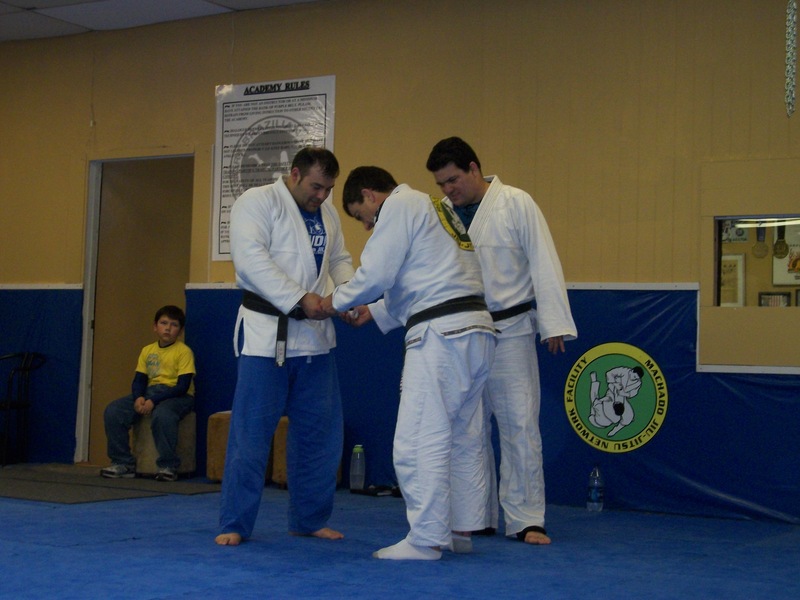 Developing a Black belt in BJJ is a continuing development in the Martial arts. When I was a lue belt, I thought Black belts were demi-gods. I thought purple belts were. It is another phase of development. When I was a white belt, my mentor Carlos Machado lent me a videotape of he and his brothers competing in Judo and Sambo. I absorbed Jean Jacques and John Machado’s leg locks in the Sambo tournaments. I practiced it in my mind thousands of times and then on the mat. Carlos gave me great drills in my private lessons each week, and I would write them down, takes notes on my sparring, and more importantly I would note on my notes my strategies. This taught me something very unique. I was telling my students in class last night how I thought I was the student who was not getting techniques as well as the others. I was the only one taking notes. So how did that perceive to me? Everyone else I thought was memorizing techniques much better than I. Of course I was wrong, I simply did not want to forget anything I learned or executed during sparring. To this day, I still have about six notebooks of all my class times with all the Machado brothers. At times I review my notes, and I think of a Japanese documentary about Guru Dan Inosanto and the JKD Martial art. I remember one of his top students Yuri Nakamura. In the documentary, Yuri is speaking with Inosanto in his office. Yuri is fascinated with all of Bruce Lee’s drawings, notes and Martial arts writings. I was too. And I felt it was a way to preserve a history of JKD in that documentary. I took notes each of my classes. I really thought this would help. I have every seminar I taught documented on notes as well. Why? Because like our parents took pictures of us as children, when we graduated from high school or other important days, these historical timelines remind and preserve what you learned and experienced. I thought the best way on developing is chronicling your history. I will never forget when I visited my instructors at their amp a few weeks back. I had to cancel a seminar I was supposed to teach that weekend, and tried to get a last minute flight to Dallas. When I came in, I spoke with the brothers. Carlos asked all the brothers to take a picture with me. That picture is a wonderful piece of my martial arts history. I have all five brothers and John’s son in it. It’s great because 50 years from now, we are all going to appreciate it even more. Going back to developing your Black belt, I usually write one of these parts every few years. www.austinbjj.com orwww.williamvandry.com to review the past parts. I remember in 1999 when I first came to Austin. There was a student who trained five years at a different school. One of my students arm barred him in a Dallas tournament, and talking with my student he stated that he trained in Austin. My student told him I was in Austin. The original person did not know who I was and came up to me stating that he wanted to ‘check’ my school out. Of course he didn’t say that respectfully. I knew what he meant. What he meant was he wanted to come by and show you much better he was. Well, he got a big surprise. My 4 month white belts gave him a rough time, and he had a change of heart in philosophy, attitude and personality. He then told me he wanted to train under me, and learn under me. This does not impress me. And I was not impressed with him either. I told him that despite not training with a Jiu-jitsu instructor that has trained and learned as much as I did at that time, I still insisted that he respect his instructor. I told him that he still trained five years with his instructor, and despite what he feels about his level, he still owes his instructor because without him, he would never have been introduced into Jiu-jitsu. Of course the opposite happens. In a previous article, I noted the point when other schools solicit you. This happens to many of my students. I had one email me and he made a joke telling me about a different school that emailed him claiming they had so much to offer to teach him if he joined their school. Of course the other school didn’t even check to see that my student doesn’t even live in Austin anymore, but I think we see the point. My student also made a joke that the instructor had no experience in BJJ when I was a Black belt. This is something I don’t teach. I think one huge lesson is the reality of life. In a past article, Rigan Machado said to me that students come, students go, money comes, money goes, but your true friends and family you always have to keep them close, always.